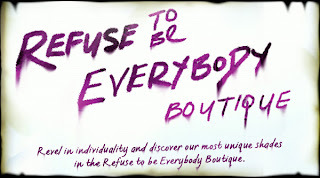 Refuse to be everybody boutique! Illamasqua’s fearless dedication to night-time make-up for the alter ego sees us unleash an all-new online shop for those who dare to be different. Our Refuse to be Everyone Boutique is exclusive to Illamasqua.com, and features products that are unavailable anywhere else. Including our most individual and unique shades drawn from Illamasqua’s restless pursuit of its creative impulses, the Refuse to be Everyone Boutique offers you a new way to revel in individuality and challenge mediocrity. Everything that you discover within the Boutique’s virtual shelves is a limited edition and once it’s gone, it’s gone for good. So step up, be bold, and enter Illamasqua’s Refuse to be Everybody Boutique.